Winthrop Baptist Church (AKA First Baptist Church of Saybrook) is a historic congregation dating back to 1744. 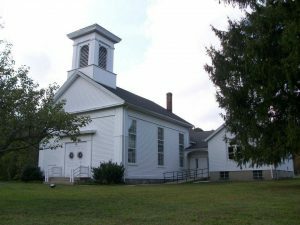 The Winthrop Baptist Church is located “on the green” at the junction of Route 80 and Route 145, and near the center of the area encompassing Deep River, Chester, Killingworth, Centerbrook and Ivoryton. Our worship services are held every Sunday morning ast 10:00 AM. During worship Christian Education activities and childcare are available for children. On the first Sunday of each month we join together to celebrate the ordinance of communion. We are one of the three oldest Baptist churches in the state, and have the honor of being the mother church to Deep River Baptist Church and the former First Baptist Church of Chester. Our membership in the Stonington Union-New London Baptist Association goes back to its founding in 1785. We also have been a part of the American Baptist Churches of Connecticut, Inc. since its establishment in 1823 as the Connecticut Baptist Convention. Our concern for God’s Kingdom universal is expressed through membership in the American Baptist Churches in the USA, Inc., and its world mission program.